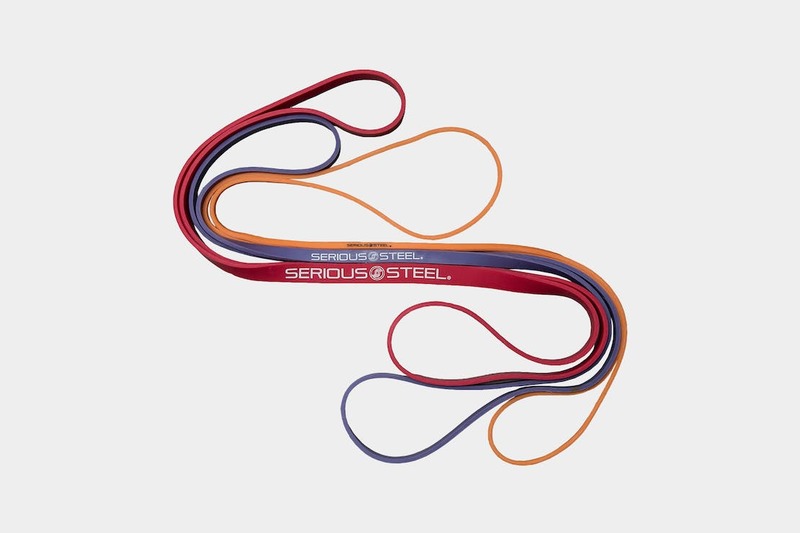 Serious Steel Resistance Bands offer a budget-friendly, lightweight, and versatile way to resistance train and stay in shape while traveling. Without a doubt, versatility and low carrying weight are some of the most important variables for on-the-road fitness. No one in their right mind wants to throw a pair of Power Blocks in their carry on. However, due to the rising popularity of traveler-oriented fitness gear, it’s easy to get lost in the weeds trying to find a product that actually works and satisfies these requirements without breaking the bank. We previously reviewed the TRX Go Suspension trainer as one option to fit this niche, but there are other pieces of equipment that are lighter and more packable for those who really want to save space and keep their carrying weight down. Although they may be a little old school, resistance bands are a highly packable, multipurpose piece of workout equipment. They are a great option for beginners who want to start building strength and flexibility during longer trips, but can also serve as a stop gap for more advanced trainees who lack consistent gym access. There are hundreds of different types of resistance bands to choose from, but very few are ideal for travelers since weight and portability are top concerns. Loop-style resistance bands are an enticing option due to their minimalist design. They are essentially large rubber bands that don’t have the added bulk of handles or carabiners. Despite their lack of bells and whistles, these resistance bands still afford challenging workouts that can be done almost anywhere. They can be used to add challenge to traditional bodyweight exercises like the squat and pushup and can also simulate the use of dumbbells or light barbells for a variety of traditional exercises like shoulder press, cable rows, bicep curls, and tricep extensions. The bottom line: well-selected loop resistance bands will allow you to get a challenging strength training workout in anytime, anywhere without weighing down your pack. For a good balance of price and performance, Serious Steel’s resistance bands, also called “assisted pull-up bands”, should be on your radar. Starting at $10, Serious Steel’s bands are made of a heavy duty latex material that is designed for band-assisted exercises (for example, pull ups and dips), meaning they are strong enough to support your body weight. However, despite their durable design, the bands are surprisingly lightweight and compressible. The smallest band weighs around 55 grams (about 2 ounces) and fits in the palm of your hand when compressed. 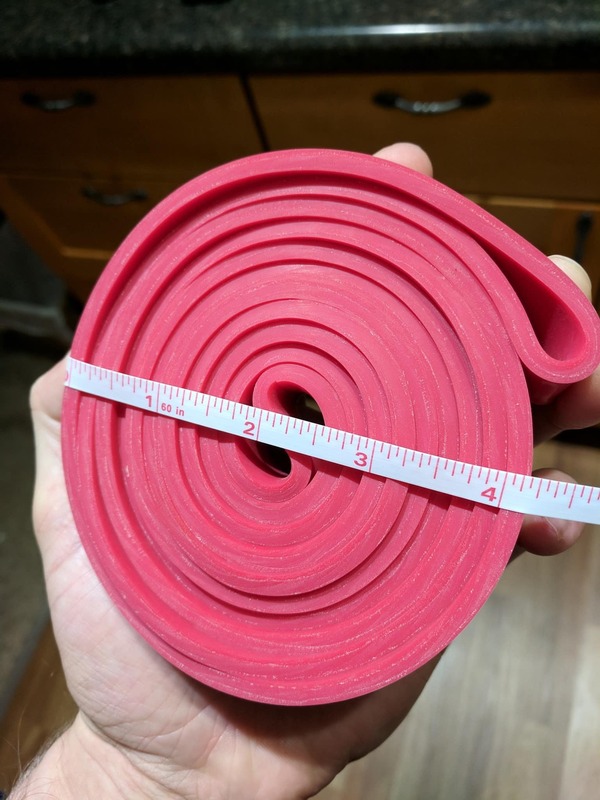 The largest band we reviewed (10-50lb red) weighs in at 193g and packs down to a 4″ by 1″ cylinder. Fresh out of the box, the bands feel great. They are sturdy, grippy, and have a resistance that increases smoothly as you stretch the band. As with any latex product, the bands do initially come with a mild, rubbery odor. The odor is fairly noticeable and likes to stick to hands when the bands are new, but exposure to fresh air and a quick rinse with warm water and soap will take care of it. So as long as you plan ahead, your entire trip’s wardrobe won’t smell like a rubber factory. During the first few months of heavy use, Serious Steel’s bands do not exhibit any noticeable loss of elasticity or degradation of the latex. However, anyone with experience using resistance bands can tell you that they do lose elasticity and eventually break if they are used often enough. As a cautionary measure, these resistance bands should be routinely inspected for imperfections and replaced as needed in order to maintain consistent tension. Due to their low cost, we feel that this is not a major cause for concern, but it’s something to keep in mind if you don’t want to worry about purchasing replacements in the future. It’s also worth noting that higher tension bands are much more resilient to normal wear and tear due to their increased thickness, so you may not run into this issue at all with heavier bands. 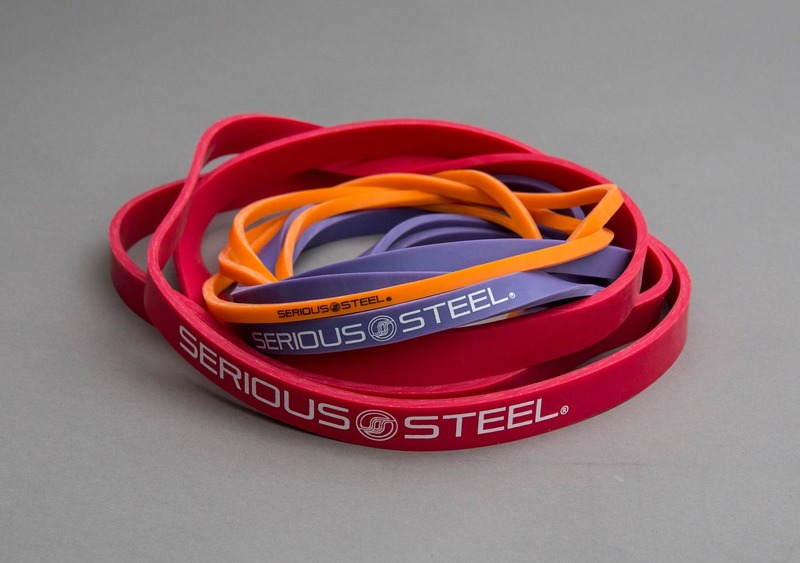 Depending on your goals and current fitness level, Serious Steel has a number of bands to choose from. A 2-15 lb tension band would be ideal for rehabilitative exercises, posture improvement, and warming up, but will also degrade fastest with regular use. Moving up the ladder, a 5-35 lb band is more suitable for light resistance exercises for those who have little or no experience with strength training or who are new to training with resistance bands. This band will still experience breakdown and tension loss, but much more slowly than the 2-15lb. Next, 10-50 lb bands are intended for those with some experience using resistance bands or who have done strength training in the past. This is a great option if you want a one-size fits all band and are more of a beginner when it comes to your training. Finally, more advanced folks may consider a 25-80 lb band. In all likelihood, this is the highest band tension that will have value for travel use due to its size and weight. Unless you are very strong or have lots of room in your pack, anything heavier than this will be impractical from a weight and utility perspective. 2-15lb (orange): Band feels great with no structural imperfections. Tension is smooth and accommodates as expected for a brand new band. 5-35lb (purple): No imperfections and tension is as expected. 10-50lb (red): No imperfections and tension is as expected. 2-15lb (orange): No noticeable imperfections with a slight, but noticeable tension loss. This band was used more often than the others, so this is to be expected. 5-35lb (purple): No noticeable imperfections and very minor tension loss (if any). 10-50lb (red): No imperfections and very minor tension loss (if any). Rubbery smell from bands can be strong initially. 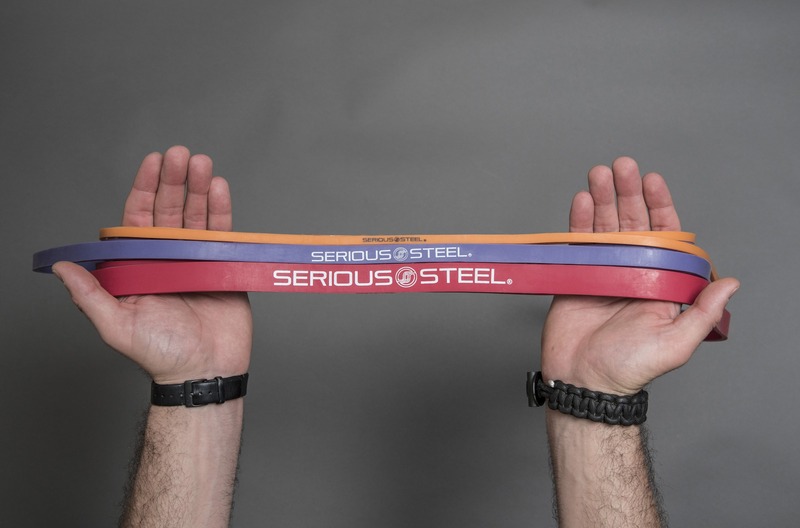 Serious Steel’s resistance bands are a good option for lightweight travelers who want to improve their strength with minimal investment and added packing weight. Like all other resistance bands, they will need to be replaced intermittently due to loss of elasticity and tears. But for the frugal traveler they will provide many hours of challenging workouts without breaking the bank.